Recognising that over the next 30 years the number of people in Ireland over the age of 55 will double and the number over 80 will quadruple, there are lots of initiatives dedicated to positive and active ageing in the capital city. In 2013 the Irish Department of Health published the National Positive Ageing Strategy which set out a ‘vision for an age-friendly society through the achievement of four national goals (participation, health, security and research)’. Dublin City Council claims the city was the first capital in the world to adopt a city-wide approach to becoming age-friendly. In order to do this the Dublin City Age Friendly Programme 2014-2019 tackles nine key areas that may negatively impact on older individuals. Under a series of headings it commits to providing alternatives to sheltered housing (Home and Community); supporting older people’s engagement with social and community life in which they live (Social Economic and Political Life); helping people volunteer or work in their locality (Learn, Develop and Work); providing facilities to engage in sports and activities (Healthy and Active Living). It also aspires to make the public sphere more manageable for older people such as providing adequate seating and level footpaths (Outdoor Space and Buildings); ensuring that public transport is adequate for journeys that older people are taking and the pedestrian crossings are timed at the correct speed (Transport, Safety) and finally ensuring access to information, both online and off-line for older individuals (Information). Over the course of my research I will look at some of these initiatives more closely, but for now I’m interested in exploring how people access information. It is here that the digital divide can be most striking: when smart and competent people find themselves grappling with digital technologies such as simple commands on smartphones and computers. For an ever-growing number of activities such as booking a flight or reserving a table at a restaurant one is required to do it online. 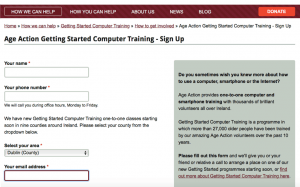 One organisation that is working to combat digital exclusion is Age Action and I was interested to note that one route to signing up for computing courses is by filling out an online form!. What at first glance looks like a contradiction is in fact something quite different. The Age Action website is directed to friends and relatives because feeling excluded from digital media impacts whole families and networks of friends rather than solitary individuals. One’s place in a social network is continually reiterated through simple messaging such as checking in with kin or organising meet-ups, allowing people to demonstrate care as well as receive it. Of course the question remains, what about the people who need help getting started but have no one who will intervene of their behalf? For these, the digital divide remains an insurmountable barrier.